Starting today, Windows Insiders in the Fast ring will see a new drop-down in their flight settings via Settings > Update & security > Windows Insider Program to skip ahead to the next release of Windows 10. We are now at the stage in the development cycle for the Windows 10 Fall Creators Update where we’re working hard to bash all the bugs and stabilize so it’s the best Windows 10 release yet for all our customers. As we work to prepare the Windows 10 Fall Creators Update for the world, our engineering teams are beginning work on the next release of Windows 10 from our Development Branch. Windows Insiders in the Fast ring who choose to skip ahead will be given the opportunity to start trying out these builds in addition to receiving app updates again for many of the inbox apps in Windows 10 such as Photos, Skype, Groove, and Movies & TV. To stabilize the Windows 10 Fall Creators Update for release, we have “forked” the release into its own branch we call “RS3_RELEASE”. Many Windows Insiders will recall we did the same thing for the Windows 10 Creators Update when we started flighting builds from the “RS2_RELEASE” branch. Going forward, Windows Insiders in the Fast ring will continue to get builds for the Windows 10 Fall Creators Update from this branch. However, Windows Insiders who choose to skip ahead will receive builds from the RS_PRERELEASE branch. Since this fork just occurred, the builds from the RS_PRERELEASE and RS3_RELEASE branches will be virtually identical. But at some point in the future, build numbers in the RS_PRERELEASE branch will jump ahead, engineering teams will start checking in new code, and things diverge. When this happens – you will not be able to leave Skip Ahead and go back to builds from the RS3_RELEASE branch without reinstalling Windows. 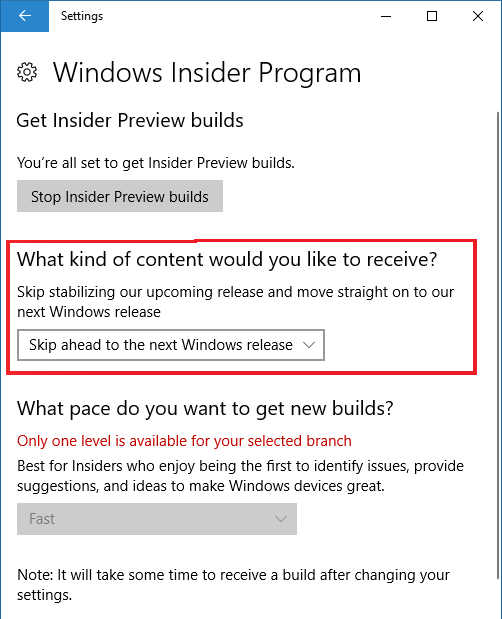 Once the Windows 10 Fall Creators Update is released to the general public, this skip ahead option will go away and the Fast ring will be back to receiving builds from the RS_PRERELEASE branch for the next Windows 10 release and inbox app updates from the Store will be fully restored to all Windows Insiders in the Fast and Slow rings. Before choosing to skip ahead – there are a few things to keep in mind: builds from RS_PRERELEASE will get less stable as teams start checking in new code. So just like Insider Preview builds usually are after a Windows 10 release, things will likely be a little rough. If this concerns you or makes you uncomfortable – don’t choose to skip ahead and simply wait for the Fast ring to transition back to RS_PRERELEASE down the road. We also need to have Windows Insiders in the Fast ring helping us get the Windows 10 Fall Creators Update ready and giving us feedback on issues they are experiencing. So there will be a limit as to how many Windows Insiders can skip ahead. Once that limit is met, the UI on the flight settings page will notify Windows Insiders trying to choose to skip ahead that it’s been closed. We are excited to experiment with putting early builds of the next release of Windows 10 in the hands of some Windows Insiders as we stabilize and prepare a release to go out to customers.